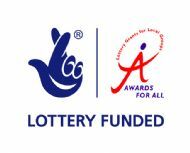 At the beginning of November 2007, the Bridgnorth & District U3A successfully gained a lottery funding grant through ‘Awards For All’ to the value of £3,894. Bridgnorth’s START TECHNOLOGY, based at Lasyard House in Underhill Street, provided the technical help to assist us in putting the application together. They also sourced the equipment and provided training sessions for the committee when it was delivered. In addition to the equipment bought with the grant, we have also used our own funds to purchase a stand for the hand-held microphone and a separate lapel microphone which is useful if a speaker needs to move about a lot during a presentation. The Mayor, Connie Baines, was the referee for our grant application. She kindly visited us at the Community Hall on 26th March 2008 to perform an official handover of the equipment. 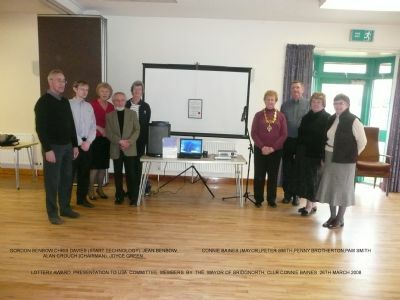 The picture below shows The Mayor together with the Committee and Chris Davies from START TECHNOLOGY.